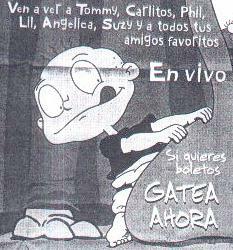 Right: Spanish version of Rugrats -- A Live Adventure logo, provided to this site by Nick Latino, (c)1998 Viacom. 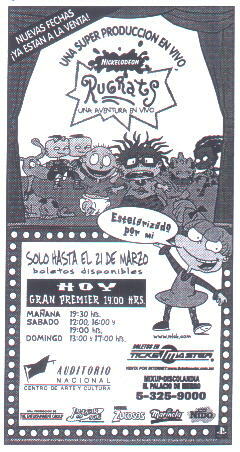 The following is a report on the Nickelodeon En Vivo stage show in Mexico City, originally published in the Reforma newspaper (9/17/98, Section E Gente! (People! ), Page 4E) , translated to English by Carolina Hernandez T.
Article is (c) 1998 by Reforma, translation (c)1998 by Carolina Hernandez T.
"Nickelodeon's characters will perform live at the Metropolitan Theatre"
Because of the excitement of watching the favorite characters of the children television channel, Nickelodeon, in just TWO hours the tickets for this Saturday, September 19, at the interactive show that'll be performed at the Metropolitan Theatre were gone. However, the Rugrats invites all the children to attend the show next Wednesday, September 22 in Guadalajara and Saturday, September 26 in Monterrey. 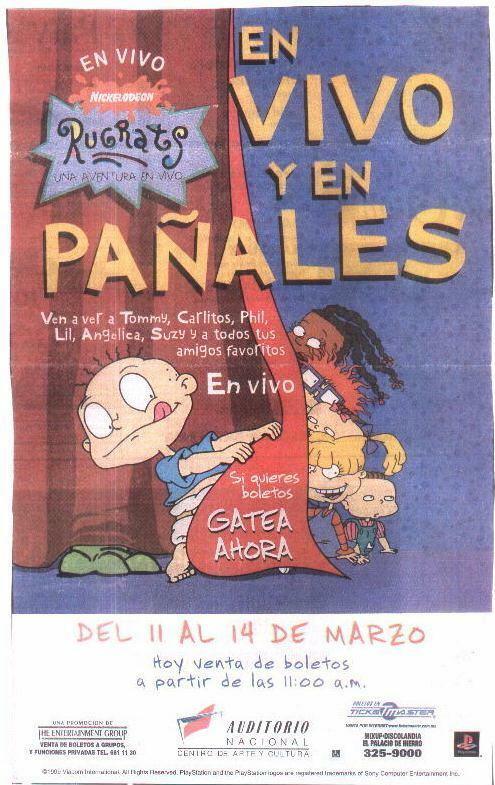 McCarty, vice president in charge of communications of Nickelodeon Latin America said that the tickets will be free and will be given at their time, and the place and time of the shows would be published so the viewers of the channel can meet "in person" their favorite characters from series like Clarissa, Shelby Woo and Rugrats. The event, called Nickelodeon en Vivo (Nickelodeon Live), said McCarty, is a 60-minute interactive show in which the children will participate on different contests with their parents, and where they'll also put in practice the pro-social initiative "Ayuda a tu Mundo" (Help your World) (similar to "The Big Help" -- SM), in which the children give suggestions on how to protect their enviroment. "This is the second Nickelodeon tour. Last year we visited 13 cities from seven countries in Latin America, with a total participation of 25,000 children and their parents. This year we'll be in 8 cities from 5 countries and we hope we'll be with, at least, 60,000 children and their families", said McCarty. The other project that the children's network will present soon is the animated picture "Rugrats", which will premiere in the USA at the end of this year and on the rest of the world at the beginning of 1999. Also, McCarty indicated that Nickelodeon Movies is developing 15 movies, some of them have been released like Good Burger, based on the popular Nickelodeon series "All That", and Harriet the Spy. 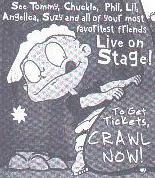 "Rugrats -- A Live Adventure" made its first stop outside the US, in Mexico City, March 11 to 14 1999 at the Auditorio Nacional. The ad used in Mexican newspapers are similar to the ones currently used in US papers. The ads are, more or less, literally translated from English. One curious note: "Gatea ahora" means, literally, "crawl now". In English ads, "crawl now" is a pun on the phrase "call now". In the Spanish version, "gatea ahora" makes no sense whatsoever to the Spanish reader. In the Spanish ads, they're better off foregoing the pun and just saying the ordinary "call now" in Spanish -- "llama ahora" or "telefonea ahora". In some Mexican communities, some theater groups are organising their own live show, probably without the participation of Nickelodeon or the producers of the tour. As an example, here's an ad (left) for a live show from Monterrey, Chihuahua, Mexico, as advertised in the 4/7/99 edition of El Norte.